He’s hard enough to see in daylight from a cruise ship; how hard to see would he be from your boat? Frank Jade was not first seen, but heard. Click through for the full story with video posted by David Hearn. Frank Jade is a passenger who fell off of one cruise ship at sea, who was then luckily recovered by another cruise ship, five hours later. He had not yet been reported lost. The picture at the very top of page is a screen capture from Mr. Hearn’s video showing the lifeboat sent to recover Mr. Jade. See if you can spot the MOB. He is there! Scott Campbell, a passenger on the Disney [Magic] ship, told ABC that he was on his balcony with his daughter at about 6:30 a.m. when he heard the man calling for help. I’ll never forget the scream, Somebody help me, Campbell told the network. Mr. Jade had somehow fallen from the Royal Caribbean Oasis of the Seas in the vicinity of Cozumel, Mexico on a cruise out of Port Everglades, Florida. Mr. Campbell was aboard Disney Magic, enjoying the early morning sea vista, when he heard a voice crying for help from the water. Mr. Campbell immediately contacted ship personnel who recovered Mr. Jade. Mr. Hearn happened to overhear some commotion related to the incident and used his new iPhone to take the video you see here. Withhold judgment about how Mr. Jade ended up in the water. 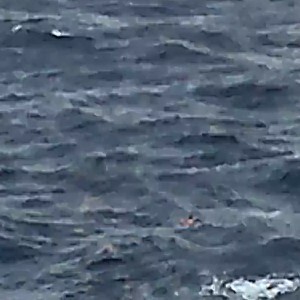 Consider what Mr. Hearn’s video demonstrates about finding an unmarked man overboard, even from an elevated position on a cruise ship balcony in daylight. If a man overboard fell from your sailboat or powerboat, with the sound of bow wave, wind, and wake nearby, would you be able to hear him? Would you be able to find him at night? If you have thrown your MOB a dan buoy, the answer is Yes! The SOS Marine dan buoy resolves challenges of quickly deploying man overboard gear by bringing all pieces together in one fluorescent green/yellow unit with whistle, which is easy to see, easy to hear, easy to stow, and easy to deploy. And its strobe light is located at the top, extending the light’s visibility. Click to buy the danbuoy now. What are your thoughts about finding a man overboard?